The state Department of Education introduced the Future Ready PA Index this school year as the new public vehicle for displaying academic achievement and other measures of a school’s success. The dashboard replaced the School Performance Profiles [SPP] the department had used since 2013 to report overall annual progress and academic achievement in the state’s public schools. The SPPs are still used as a measure of effectiveness for teachers and principals. Gov. Tom Wolf and education department officials lauded the new index at its introduction in November as a fairer way to evaluate schools because it provides multiple measures for assessing schools in contrast with the SPPs, which provides a single score for each school. Among the measures displayed in the index are proficiency rates in English, math and science as well as growth rates — the percent of students who move ahead by one academic year. The index also includes third-grade reading scores, seventh-grade math scores, attendance and graduation rates and the percentage of students passing industry-based standard tests. While the index replaces the performance profiles as the main measure of a school’s effectiveness, the SPP score accounts for 15% of a teacher or principal’s evaluation. Each school’s score can be found under the “educator effectiveness” link on the department website. Use of the scores in annual teacher evaluations has been opposed by teachers unions, including the largest statewide union, the Pennsylvania State Education Association [PSEA]. The reason: high-poverty school buildings tend to have low SPP scores, making it difficult for teachers in those schools to get high marks in evaluations. The Pittsburgh Federation of Teachers [PFT] also opposes the use of SPP scores in evaluating educators. "Use of the metric in professional educator ratings is not realistic or fair — particularly for non-teaching professionals like counselors and social workers," PFT vice president William Hileman wrote in an email. Hileman wrote that using a metric that is "measuring things outside of the control of the educator for evaluation" discourages them from working in schools "that need them most." "This policy hurts students, educators and schools. It is not rational," Hileman wrote. SPP scores are based heavily on test scores; 40% of the score is dependent upon proficiency rates and 40% is determined by academic growth (how many students achieved a year’s worth of academic growth even if they didn’t reach proficiency). Graduation, attendance and promotion rates, along with the number of Advanced Placement, International Baccalaureate and college credit courses, and PSAT participation are worth 10%. The remaining 10% is awarded based on how schools close achievement gaps. The scores are based on a scale of up to 100 points, with the possibility of seven additional points. The bonus points can be acquired based on factors such as the percent of students who score proficient on the Pennsylvania System of School Assessment and Keystone exams as well as industry-based tests for career and technical education or the number of students who score a three or above on Advanced Placement tests. A review of the SPP scores in Allegheny County, based on data from the 2017-18 school year, shows the scores once again fall along the lines of the economic makeup. According to state data, schools with high percentages of economically disadvantaged students often have low SPP scores. Among the Pittsburgh Public Schools, the highest SPP score belongs to Pittsburgh Montessori K-5 at 84.2 and the lowest score among the traditional schools was at Pittsburgh Westinghouse Academy 6-12 at 37.2. Three schools for students with special needs — Pittsburgh Conroy, Pittsburgh Oliver Citywide Academy and Pittsburgh Pioneer — scored lower. Of the 42 county school districts outside of the City of Pittsburgh, the SPP scores ranged from a high of 98.6 at Franklin Elementary in the North Allegheny School District to 38.6 at Sto-Rox Primary Center in the Sto-Rox School District. 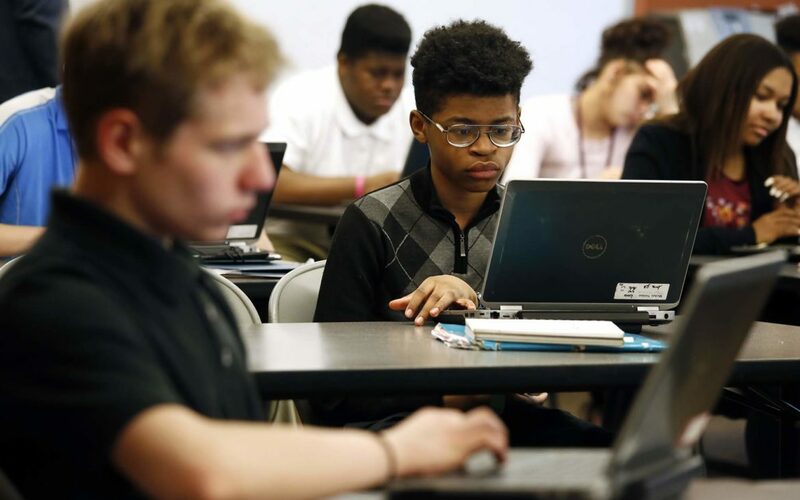 The highest charter school score was 76.5 at City Charter High School and the lowest among the traditional charter schools was 46.1 at Propel Northside. Hill House Passport Academy, a diploma retrieval school, and New Academy Charter School, which serves court-adjudicated students, scored 29.6 and 28.7, respectively. Click the black arrows to see school demographics and the percentage of economically disadvantaged students. Click the black arrows to see the school district, school demographics and the percentage of economically disadvantaged students.